As the 4th International Conference of the Society for Musical Minimalism begins in Long Beach, those of us who can’t attend should have something to keep us entertained as well. 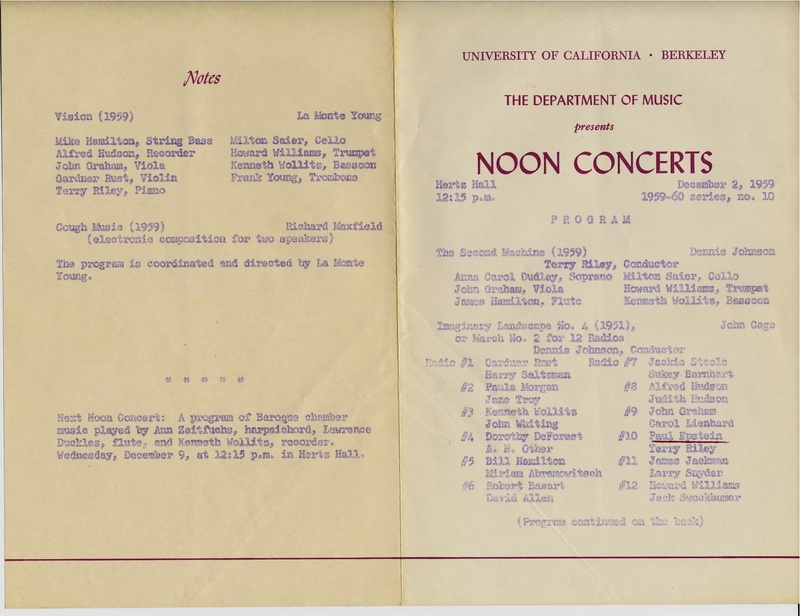 Here’s a programme that the minimalist/systems composer Paul Epstein sent us a while back of a concert he played at the University of California, Berkeley, in 1959. The pieces are landmark ones, the players include some of the ‘megastars’ of early minimalism (click on the picture to see a bigger version). Thanks, Paul, for this, as always. This concert now appears among the EMC’s list of historical events we’re going to visit once time travel is worked out properly. We’re assuming the role of AN Other on Imaginary Landscapes No. 4 will be ours when it does. Do you have any time travel favourites? Let us know! Next Next post: Cold Blue, Pezzone, too!